What a cheeky chappie Kai is. Although small he has a mighty personality. Although he doesn't love everyone immediately, once he does know you he is lots of fun and affectionate. He needs to lose a few kilos but once he has he will be quite a lively, high energy little terrier. He does seem to be quite a clean little dog in his kennel, so hopefully will be housetrained in his new home. Kai will suit an experienced,terrier savvy home. He does not like to share his treasured possessions with people or dogs, and so is looking for an adult only home. He is social with other dogs but would prefer to be the only dog in his new home though he can have doggy walking pals. 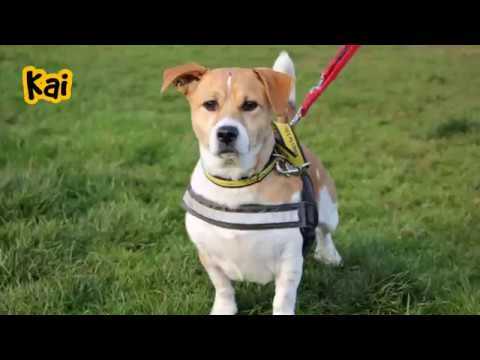 This little dog has a super personality, and will make a fantastic dog for the right owners. Anyone interested in Kai will need to chat to the training team before visiting with him. New owners will have Dogs Trust support to help Kai transition to his new home. Thank you for your interest in Kai, who is based at Darlington. Please note this is not a reservation on this dog. To start the rehoming process you will need to go to a rehoming centre for a quick chat. Please find information below about what to expect during the rehoming process. We hope to see you soon.